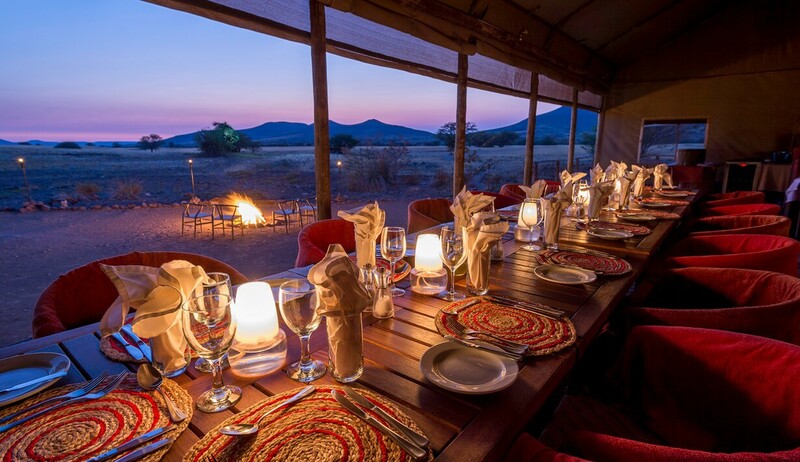 This specialised Namibian safari affords you the chance to experience this magnificent and memorable country in a very personal way. 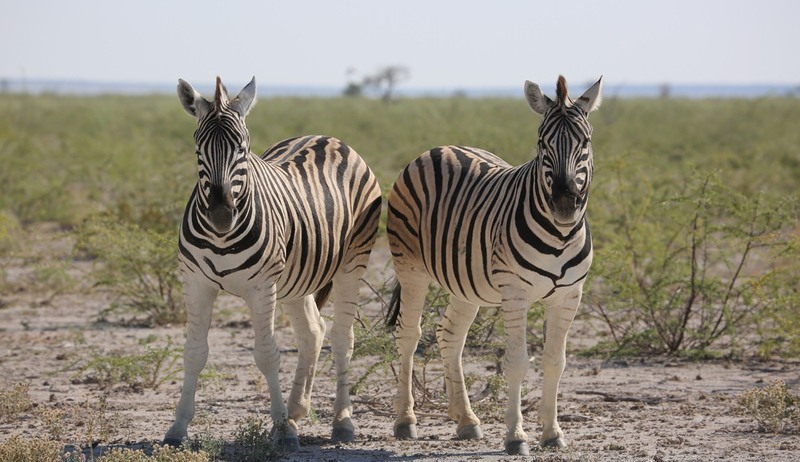 You will stay in some remarkable locations and track some of the most sought after Namibian wildlife including desert adapted elephants, black rhinos, lions, leopards and cheetahs, whilst having the chance to spot numerous endemic bird species all with the help of your highly experienced private guide. 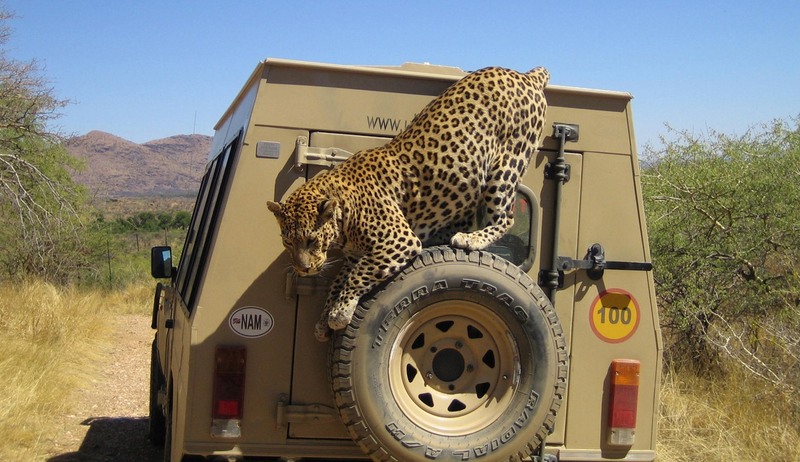 This really is a trip of a lifetime for any wildlife enthusiast. 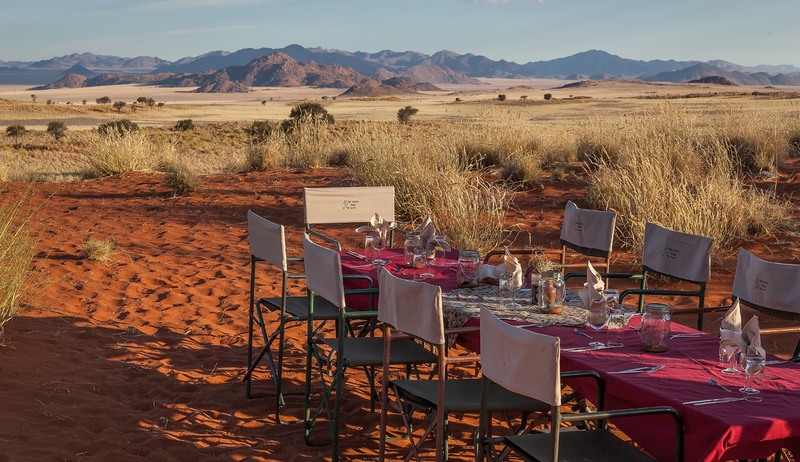 Stay in the only camp inside the world’s 4th largest National Park at Sossusvlei and climb the world’s highest free-standing sand dunes. Sea kayak with seals and dolphins on the Skeleton Coast. 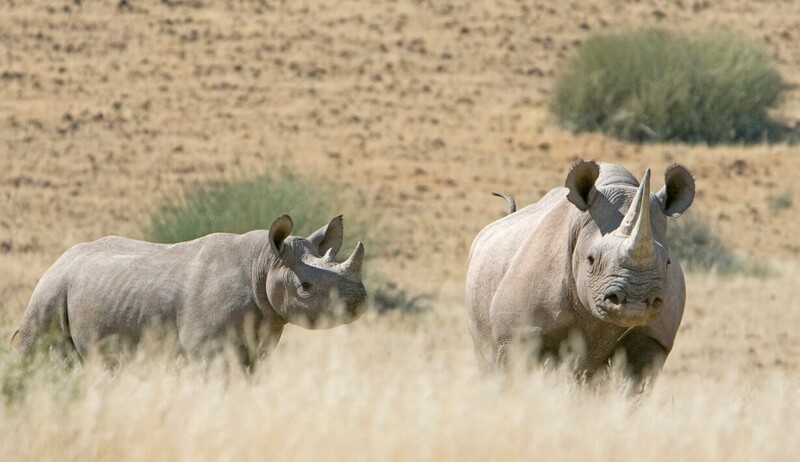 Track for desert-adapted elephants and the endangered black rhino. 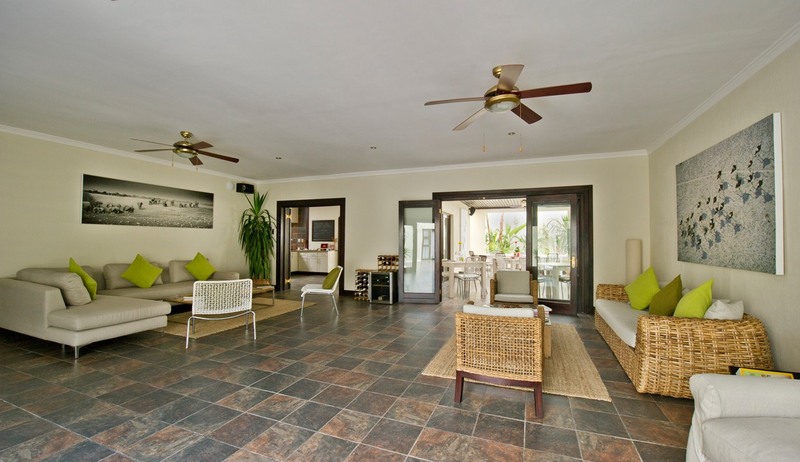 On arrival in Windhoek you will be met by your private guide and transferred to the well appointed Galton House. You will have a brief city tour before having the rest of the afternoon to explore the city in more depth at your own pace or relax after your long journey. After breakfast you will head towards the Namib Desert, via the scenic Khomas Highlands and Seriem Canyon. 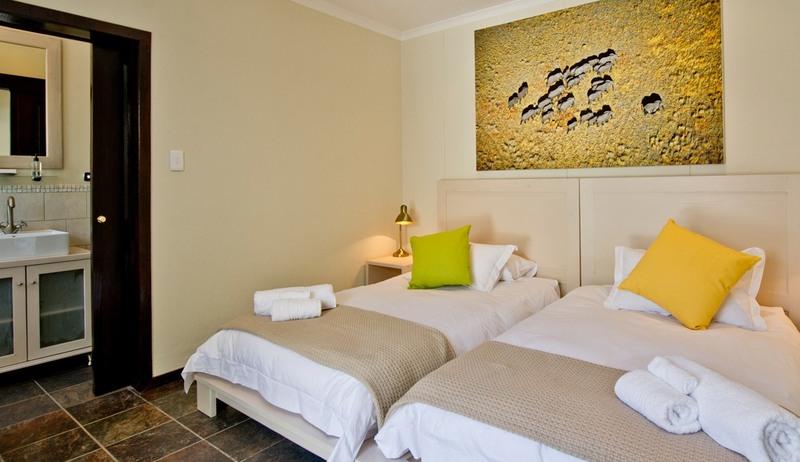 Tonight you will stay at Sossus Dune Lodge, being located within the National Park you will enjoy pre sunrise and post sunset access to Sossusvlei. 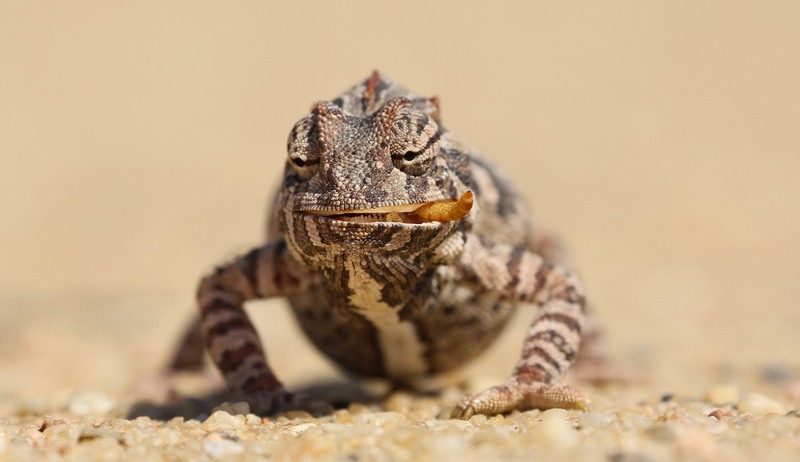 This area is home to a variety of endemic fauna and flora species, such as the dune lark, Rueppell’s korhaan, Namib golden mole, hairy-footed gerbil, shovel-snouted and wedge-snouted lizards, a variety of tok tokkie beetles and many more. 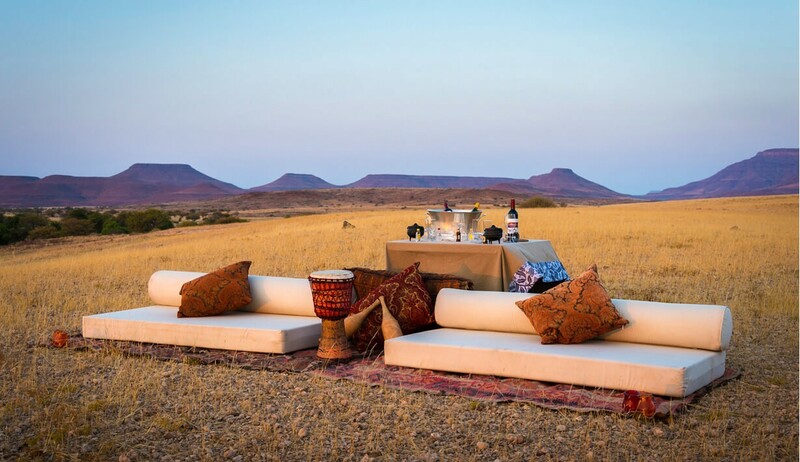 After enjoying an almost magical sunrise over the Namib Desert you will have some time to explore the area at leisure before heading to Tok Tokkie Basecamp. From here you will do a two day walking safari through one of the most beautiful deserts in the world, where you will learn about the intricacies of the desert fauna and flora. 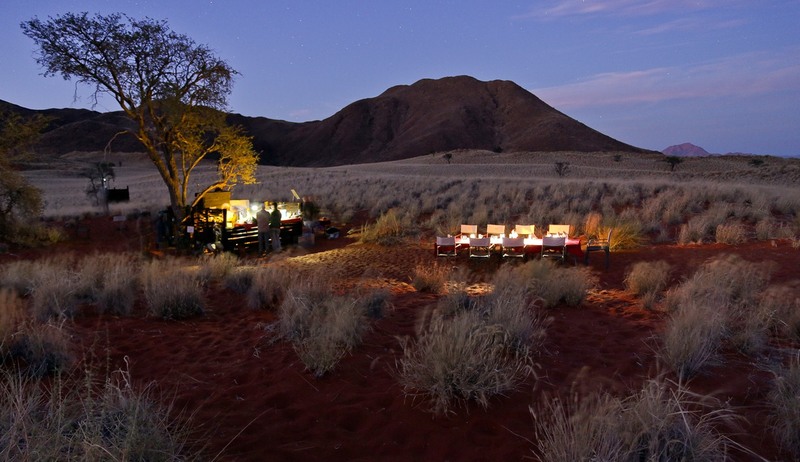 Each night you will arrive at a different wilderness camp, where you will have your own open air bedroom under a blanket of stars - this is a ‘once in a lifetime experience’ and something that will stay with you forever. After breakfast you will drive northwest towards the coastal town of Walvis Bay passing the impressive Gaub and Kuiseb canyons on route. 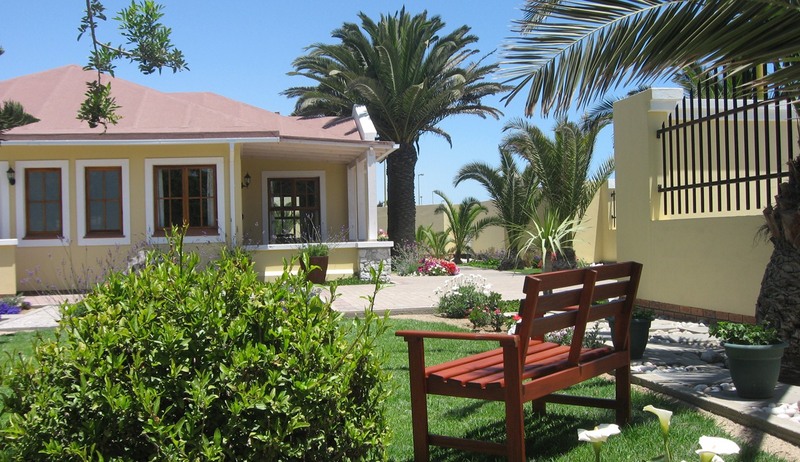 There will be time to enjoy the lagoons, home to pelicans, flamingos and other sea-birds, before continuing north to the pleasant seaside town of Swakopmund. There will be an afternoon orientation tour of Swakopmund and a night walk in the Swakop River Valley which focuses on the nocturnal reptiles and insects of the Namib Desert. You can spend the morning doing a gentle kayaking trip which is a perfect way to see Cape fur seals, heaviside and bottlenose dolphins, pelicans, flamingos and a wide variety of other sea birds. In the afternoon you may like to partake in some of the extra activities the area has to offer including camel rides, scenic flights, quad-biking in the dunes, sky diving and more. 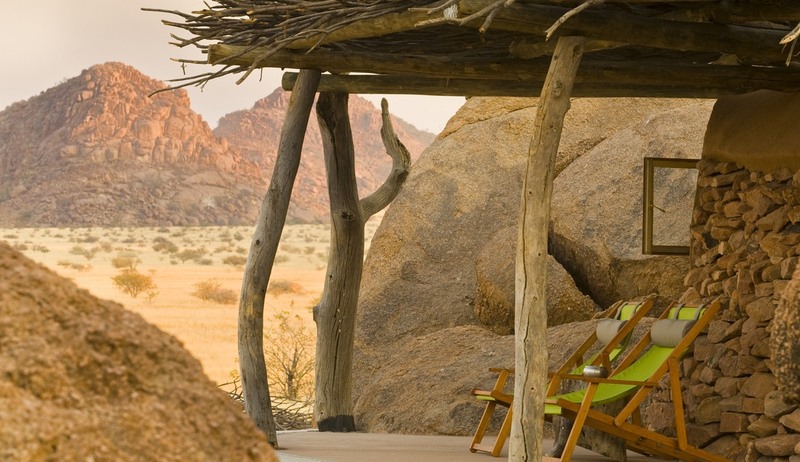 Today you head Northeast to the diverse region of Damaraland, passing Namibia’s highest mountain, Brandberg on route. Damaraland is typified by both its dramatic landscape and its wildlife, being home to many endemic species such as the desert adapted elephants, lions, rhinos and bird species such as herero chat, Monteiro’s hornbill and Benguela long billed lark. This afternoon you will have time to visit the nearby attractions and geological sites of Twyfelfontein rock engravings (a UNESCO World Heritage Site), Burnt Mountain and the Organ Pipe. 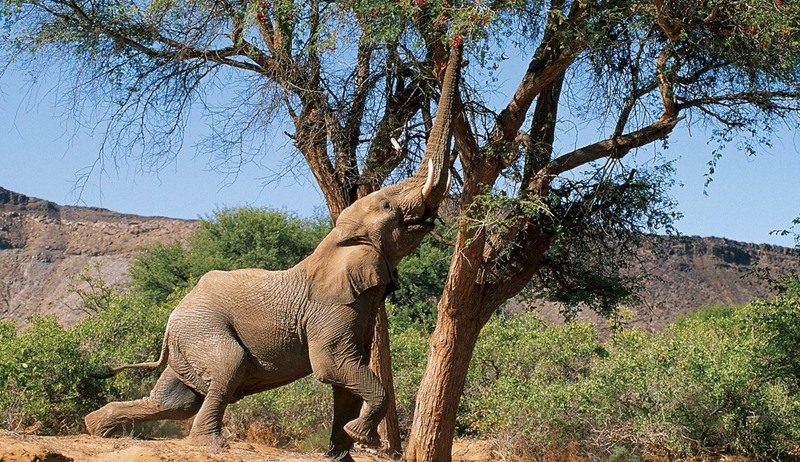 Today will be spent searching for the some of the remarkable wildlife that Damaraland has become famous for including the desert adapted elephant, lions, black rhino and giraffes and if you are really lucky you may spot endemic birds like the white-tailed shrike and the violet woodhoopoe. 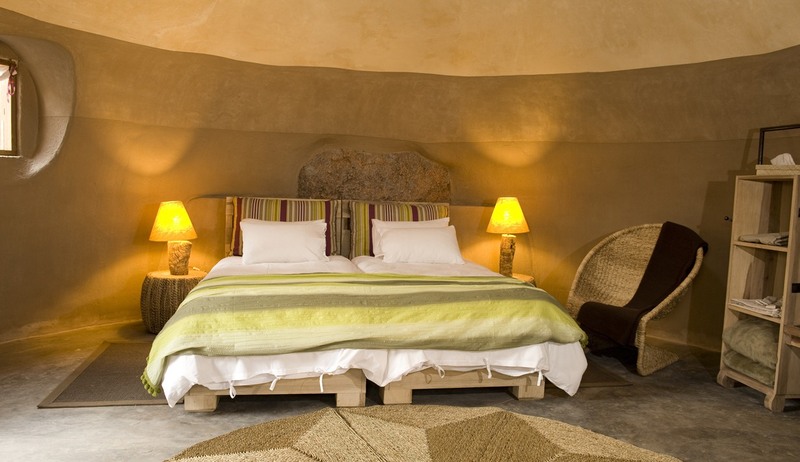 After breakfast you will head north, stopping at a Himba Settlement on route, to the private Palmwag concession. The drive from the concession gate to the lodge acts as a game drive, giving you a taste of the exceptional array of species that can be found here including, Hartmann’s mountain zebra, giraffe, desert adapted elephant, ostrich, lion, oryx, spotted and brown hyena, cheetah, kudu, leopard, and in particular this area is home to one of the world’s largest natural populations of the rare black rhino. 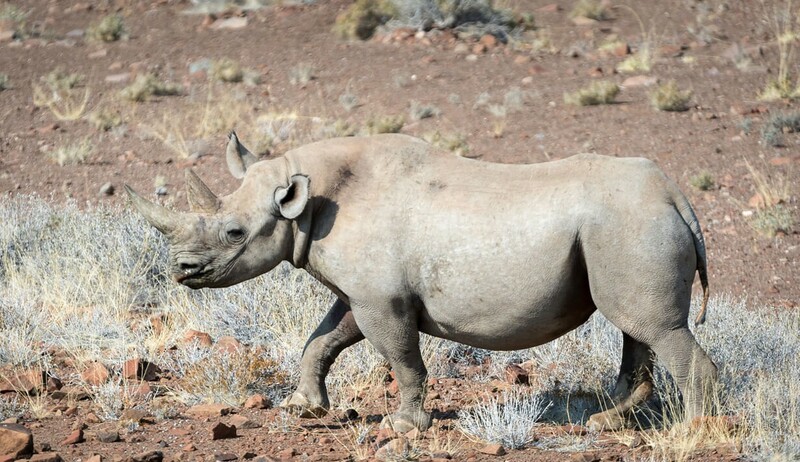 You will spend an exciting morning out rhino tracking, whilst in the afternoon you will have the choice of doing a game drive or nature walk to explore more of this vast concession in search of its incredible flora and fauna, in fact 75% of Namibia’s endemic species inhabit this last bastion of the wilderness. 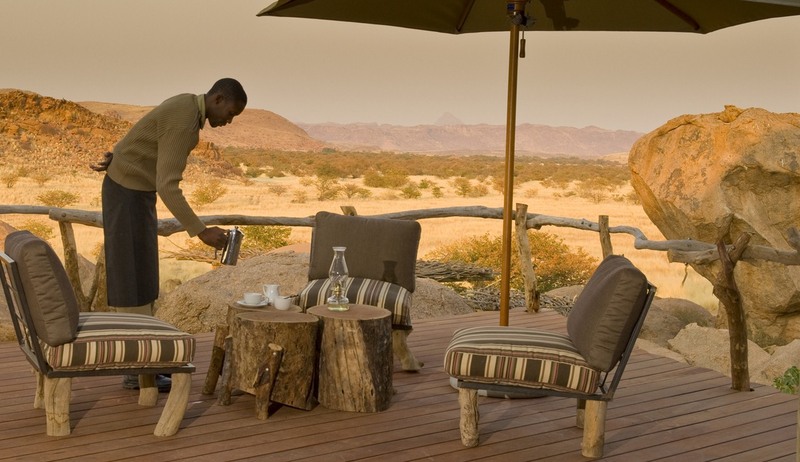 This morning you will drive to Okonjima Bush Camp, located at the base of the Omboroko Mountains near Waterberg. 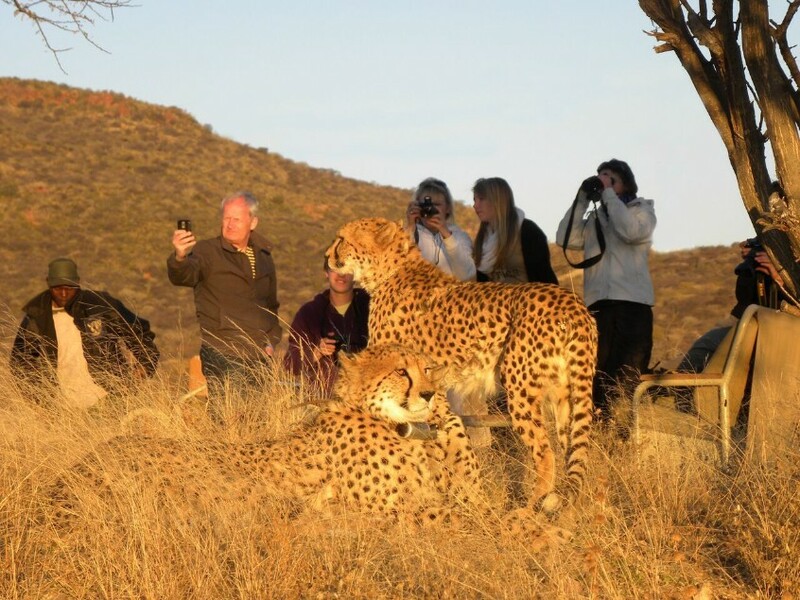 Okonjima is home to the AfriCat Foundation, a wildlife sanctuary which focuses on the research and rehabilitation of Africa's big cats, especially injured or captured leopard and cheetah. Close encounters with leopard and cheetah are an unforgettable highlight as is a visit to the night hide where nocturnal animals such as porcupine, caracal, honey badger and even leopard may be seen. You will rise early this morning for another memorable guided activity before you return to Bush Camp for a sumptuous brunch. 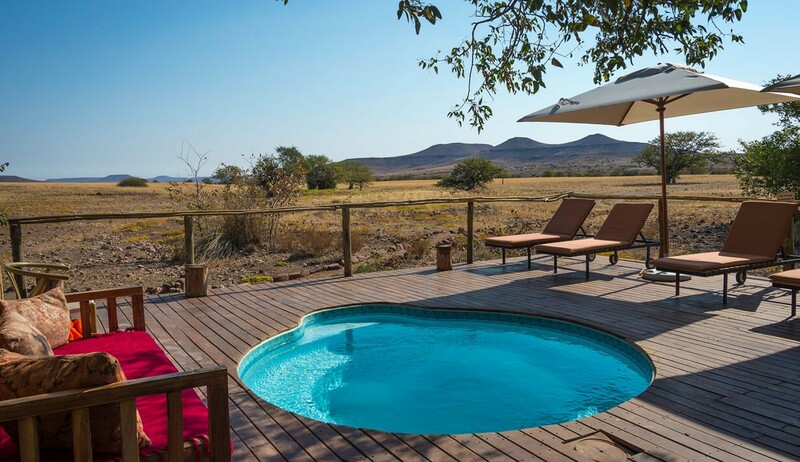 Your early afternoon can be spent relaxing by the swimming pool overlooking the waterhole and enjoying the tranquillity of the sun until you go out on another excursion to observe the work and research activities of the AfriCat Foundation. You will rise early this morning for another memorable guided activity before you return to Bush Camp for a sumptuous brunch. After freshening up you will depart for Windhoek, via the town of Okahandja, where you will have the chance to visit the woodcarvers craft market for some last minute curio shopping. 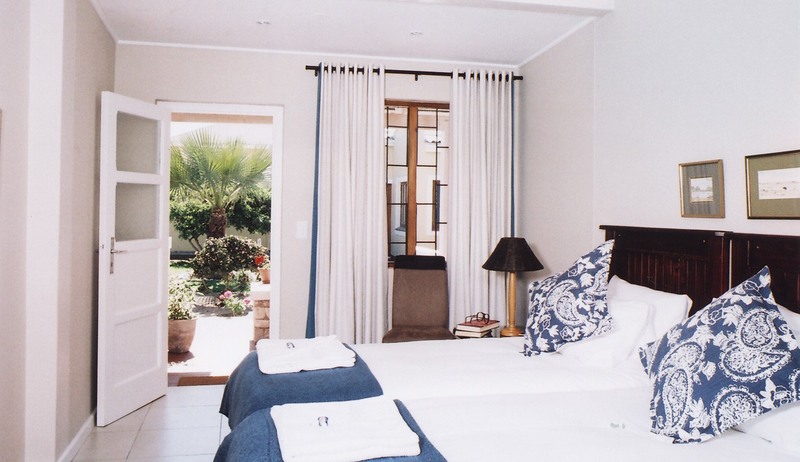 Upon your arrival in Windhoek you will be transferred to the Galton House for your last night in Namibia. This morning your guide will collect you from Galton House and transfer you to the International Airport in time for you to catch your outgoing international flight back home. 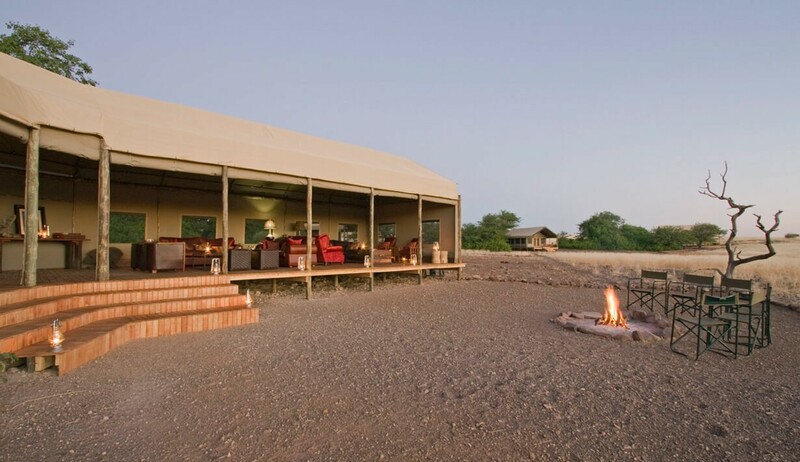 Lying amongst the rolling hills of the 450,000 hectare Palmwag concession, Desert Rhino Camp offers comfortable and relaxing accommodation coupled with unique rhino tracking experiences. 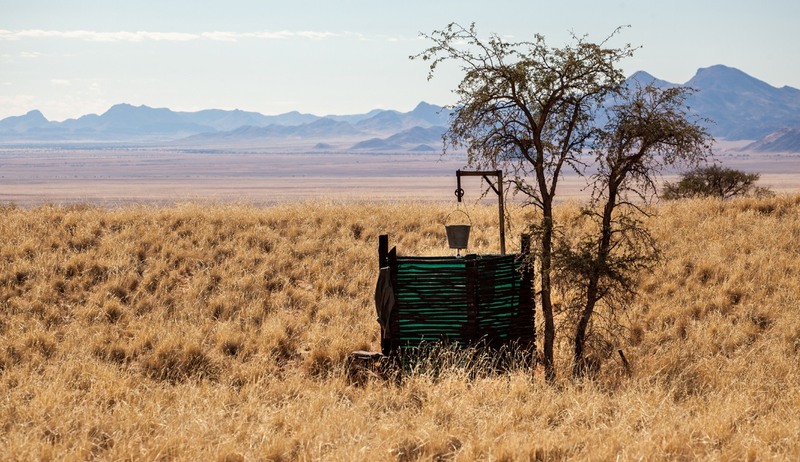 This exceptionally tranquil area is famed for its minimalist beauty and the surprising wealth of arid-adapted wildlife that manages to thrive in this harsh environment, including the largest free-roaming black rhino population in Africa. 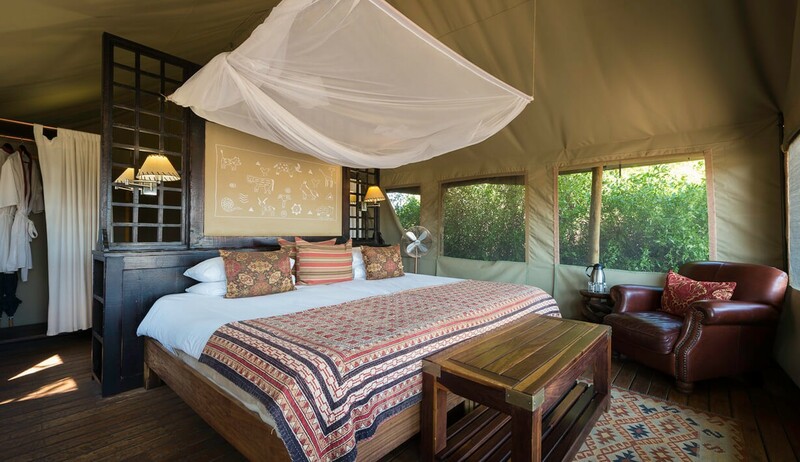 Accommodation at Desert Rhino Camp is provided in eight Meru-style canvas tents which have been raised off the ground to emphasise the spectacular views of the wide valley in which they are located. 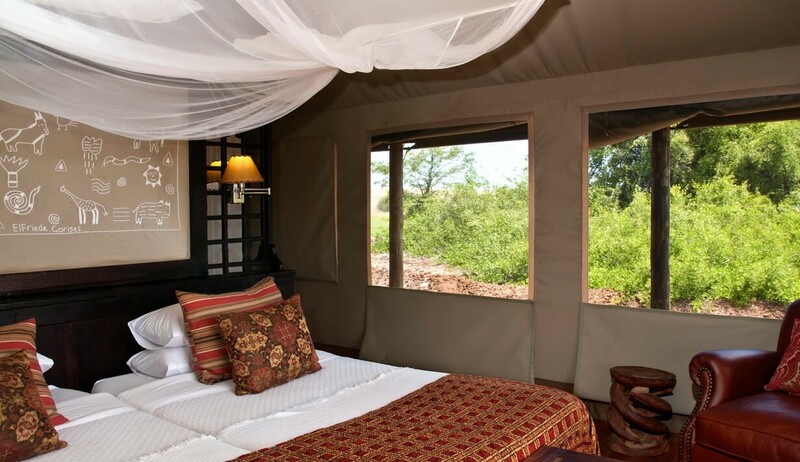 Each of these luxury tents have been furnished to a very high standard and have large, comfortable beds, en-suite bathrooms and front verandas in which to relax and soak up the atmosphere and the incredible vistas on offer, including the imposing Etendeka Mountains. 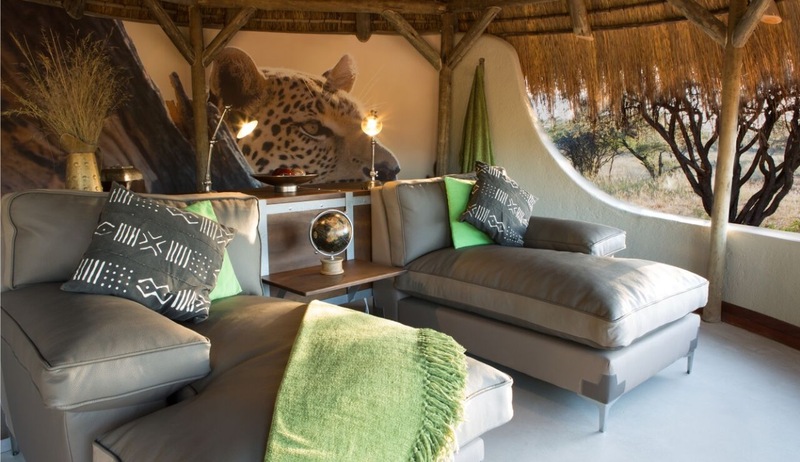 The comfortable and relaxing main area of the camp includes a tented dining and lounge area which offers panoramic views of the Concession whilst enjoying a cold drink or a home cooked meal. Often the evening meals will be taken around the fire pit under the area's famously starry skies. There is also a small swimming pool for a refreshing dip in the warm midday sun. 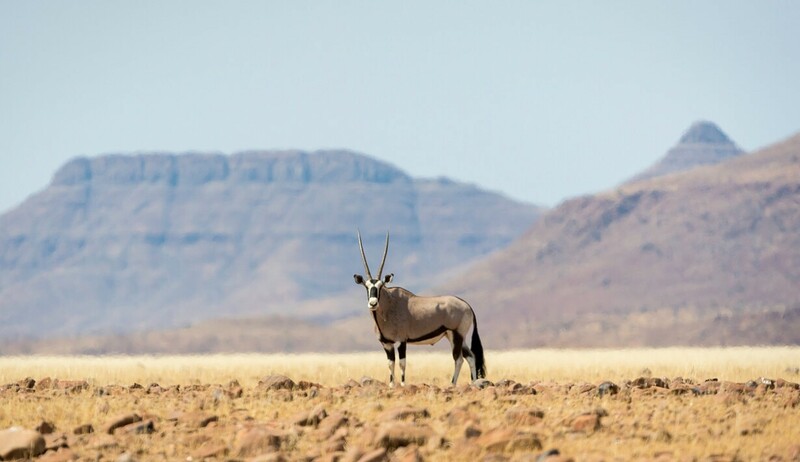 Apart from the large desert-adapted black rhino population of the area there are also many other intriguing species which can be spotted including desert-adapted elephant, Hartmann's mountain zebra, giraffe, gemsbok, springbok, kudu and predators such as lion, cheetah, leopard, and brown and spotted hyaena. Birdlife is prolific and diverse with most of Namibia's endemics present. 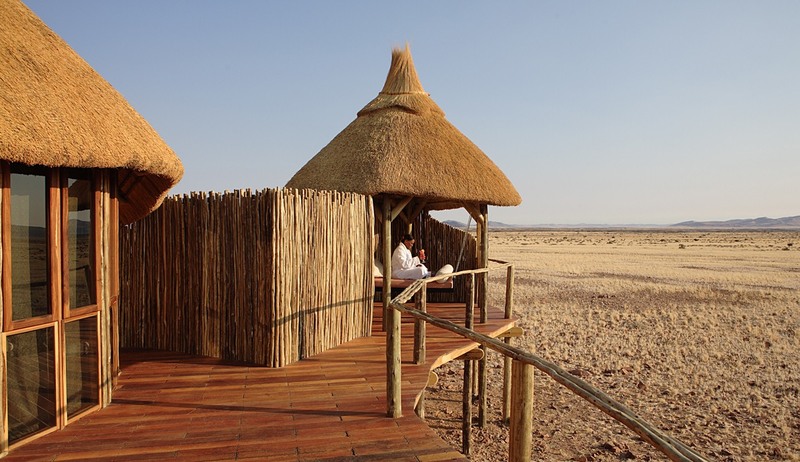 Activities at Desert Rhino Camp are mostly centred around exploring the vast, miraculous ecosystem and some of the most knowledgeable guides in Namibia can take you through this incredibly harsh environment to learn more about how the flora and fauna of this area have managed to adapt and prosper. One of the most popular activities here is Rhino tracking on foot or by vehicle, behind the Save The Rhino trackers who keep tabs on the numbers and locations of these precious animals. 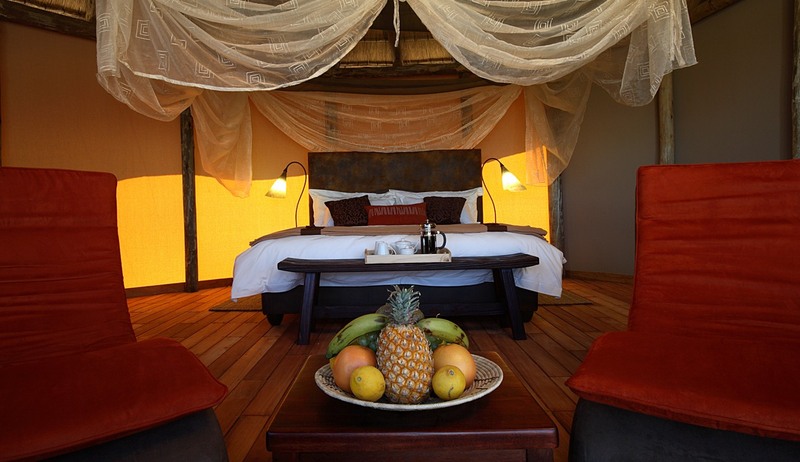 Other activities include game drives, nature walks with picnic lunch and birding. 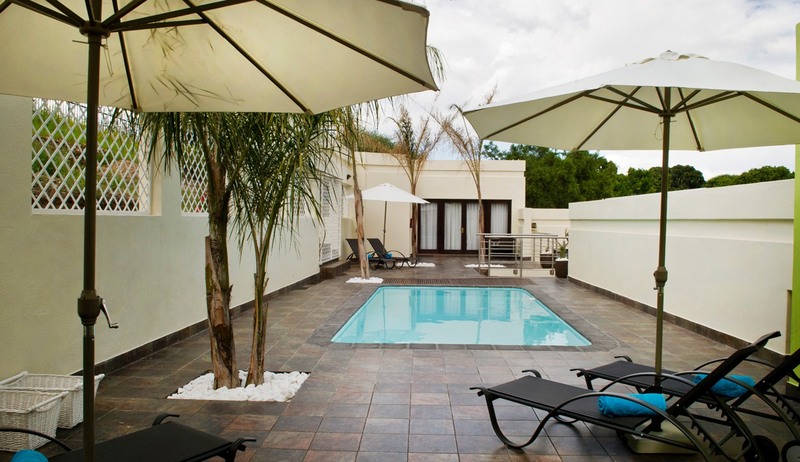 This beautifully stylish newly-opened boutique hotel is perched on the edge of Windhoek's northernmost affluent suburb of Eros and offers peace and tranquillity just 10 minutes drive from the city centre. Named after the famous explorer Sir Francis Galton, Galton House has a relaxed and welcoming atmosphere and has been designed with a combination of modern minimalistic design and understated chic to provide a luxurious setting for guests wishing to relax before or after their African safari adventure. The hotel has 8 beautiful and spacious bedrooms each of which has a luxury en-suite bathroom, air-conditioning, satellite TV and large comfortable beds. There are 4 double rooms, 1 triple room and 1 family room. 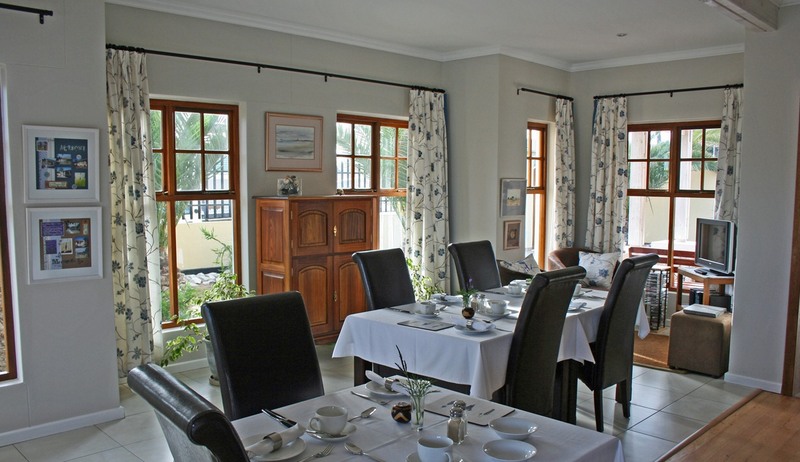 The hotel itself features a large welcoming lounge, luxurious swimming pool and a lovely indoor dining area. There is also a delightful 'al fresco' dining area by the pool where freshly prepared meals are served (including lunch and dinner). A number of shops, restaurants and supermarkets are within a short distance from the hotel making this a perfect place for a luxury stop over. 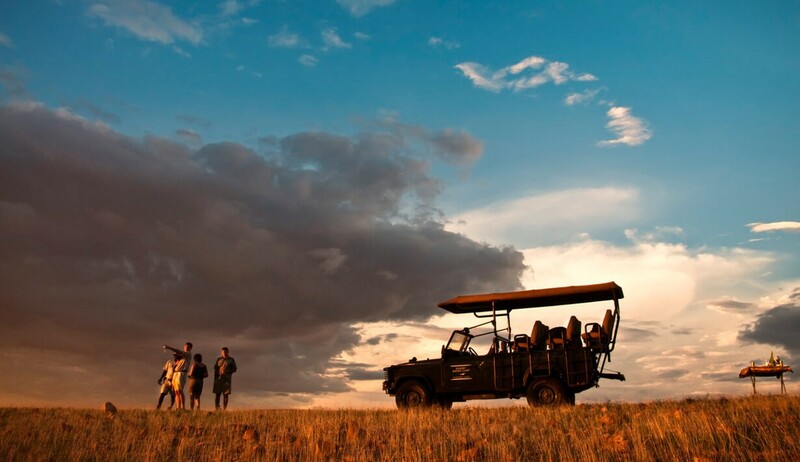 Home of the AfriCat Foundation, Okonjima is a wonderful safari destination that is just waiting to be explored, with the chance to see Namibia's big cats and other carnivores as well as learn about their conservation. 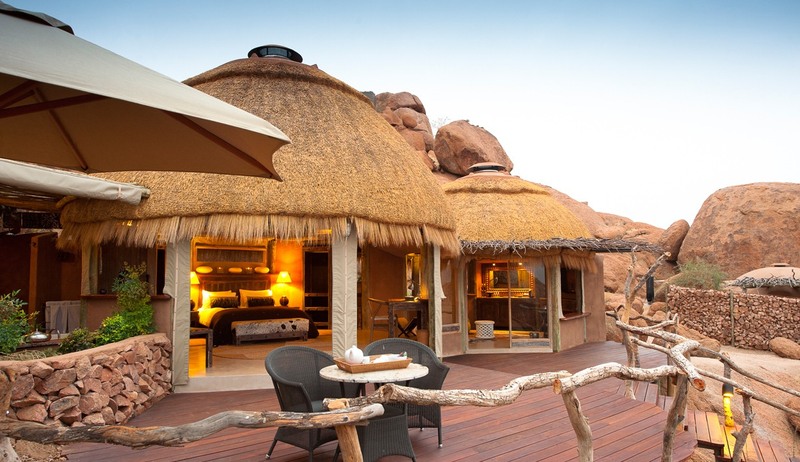 There are a number of accommodation options at Okonjima and one of the most popular options is the luxury bush camp which consists of 8 thatched, African-style chalets which offer a very high level of luxury and comfort for guests to enjoy after a long day of exploring this remarkable area. All of these beautiful chalets have been furnished, equipped and decorated to a very high standard and include a large queen size bed, a sunken lounge with a sofa that can be turned into a further small bed if needed, a minibar and a fantastic en-suite bathroom which is separated from the bedroom by sculpted inner walls. 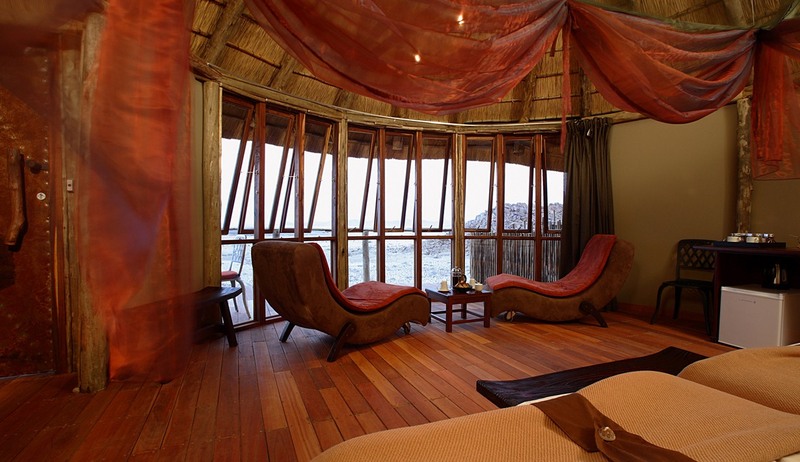 The chalets all have fabulous views over the plains and the warthogs and antelope that often grace them, and a birdbath which is frequently visited by a variety of birds and small mammals. To witness even further wildlife Okonjima has a range of activities which are of course mostly centred around the big cats. AfriCat is a non-profit organisation set up to conserve and protect threatened cheetah, leopard, and other wild carnivores of Namibia. Visitors will be able to observe some of this programme at work and learn more about these amazing and beautiful animals. Activities include leopard viewing, visits to the "cheetah project", large carnivore tracking on foot, game drives and bird watching. 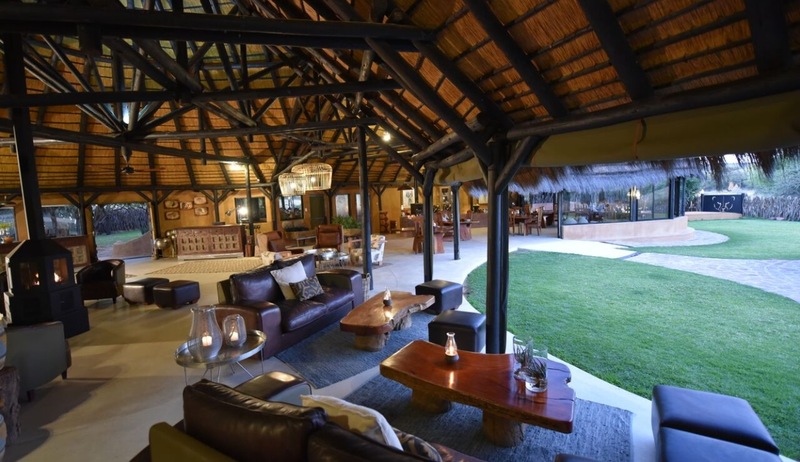 After a long day of exploring you can return to the main camp area where you will find a beautiful dining area where delicious freshly prepared meals are served and an inviting lounge and bar. 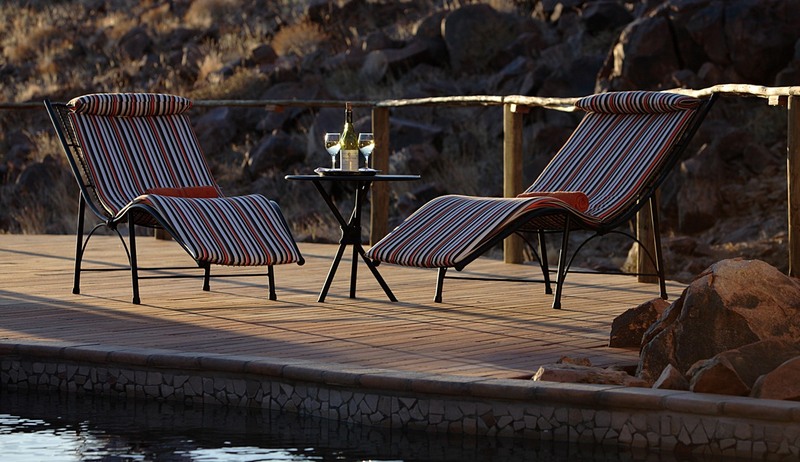 The main camp also has a luxurious swimming pool with comfortable sun loungers.